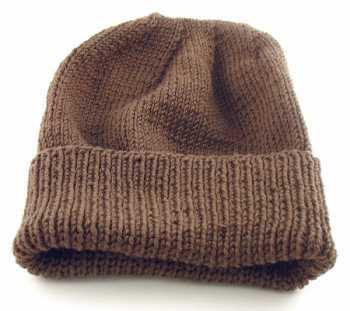 An easy-to-knit hat suitable for troops deployed to cold climates. To fit women's size with men's size in parenthesis. With #3 circular needles, cast on 100 (108) stitches. Work in 1 x 1 ribbing till piece measures 6 " from beginning. Change to #5 circular needles and work in stockinette st till piece measures 9" (10") from beginning. *Switch to double pointed needles when necessary. R1(RS): *(K10, K2tog), rep * till end - 99 st rem. R3: *(K9, K2tog), rep * till end. R5: *(K8, K2tog), rep * till end. R7 *(K7, K2tog), rep * till end. R9: *(K6, K2tog), rep * till end. R11: *(K5, K2tog), rep * till end. R13: *(K4, K2tog), rep * till end. R15 (Final row for shape crown): *(K3, K2tog), rep * till end - 36 st rem. Divide st equally onto 2 needles (you should have 18 st on each needle). With wrong sides facing each other, use Kitchener Stitch to seam together the stitches.